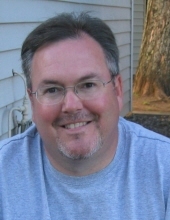 Peter T. McKenna, 50, loving husband of Kelly and father of Bridget and Caitlyn died suddenly Sunday, February 17th at UIHC. Visitation will be Thursday, February 21st from 4 to 7 PM at Lensing Oak Hill Funeral Service, 210 Holiday Road, Coralville. Mass of Christian Burial will be at 10:30 AM, Saturday, February 23rd at SS. Peter and Paul Catholic Church, 410 N. 1st Street, in Cary, IL. Burial will follow at Saint John Nepomucene Cemetery. In lieu of flowers, an educational fund has been established for his daughters. Peter was born on June 1st, 1968 in Fox River Grove, IL, son of Joseph and Grete (Miller) McKenna. He was a University of Iowa graduate and a member of Delta Chi Fraternity. On April 30th, 1994, Peter married Kelly Blaurock. Peter worked for GDIT in Coralville. He was an avid Hawkeye fan and football season ticket holder. He also loved to golf and travel. Peter is survived by his wife, Kelly; his daughters, Bridget and Caitlyn; his siblings, Kristine (Dr. Samuel) Granieri, Kathleen McKenna, Dr. Michael (Susan) McKenna, Patrick (Nancy) McKenna, Mary Jo Johnson, Julie (Mark) Bures, Jane McKenna and Meg (Casey) Warnecke; and the rest of the McKenna family; his in-laws, Jan Blaurock and Richard (Marge) Blaurock; and the rest of the Blaurock family. He was preceded in death by his parents; his brother-in-law, Christopher Johnson, and infant Hudson Granieri. To send flowers or a remembrance gift to the family of Peter T. McKenna, please visit our Tribute Store. "Email Address" would like to share the life celebration of Peter T. McKenna. Click on the "link" to go to share a favorite memory or leave a condolence message for the family.